When Danny Cipriani made his England debut in 2008 aged 20 he was touted as a great hope for the future and expected to be there or thereabouts at fly-half for years to come. But the seven caps he won in that years remain, to date, his only international honours. Indiscipline and a love of the more glitzy life has meant he has too often made the tabloid pages for nights out and glamorous girlfriends rather than the back pages for his on-field achievements. Cipriani was a talented all-round sportsman who played football and cricket to a high level as a schoolboy, but it was on the rugby field he really shone. Fast and with superb hands, Cipriani made his mark at Wasps as well as playing for England at Under-16 and Under-19 levels. But it was a sign of things to come when his international debut was delayed by a week after he was pictured coming out a nightclub two days before the match. He made a remarkable recovery from a dislocated ankle sustained at the end of the 2007-08 season but he was disappointing when recalled for the autumn internationals and he was beginning to attract attention from the tabloids because of his on-off relationship with model Kelly Brook. It was clear he was out of favour with the England management - further injury did not help his cause - and in the summer of 2010 he joined the Melbourne Rebels, ruling himself out of any international recall. In Australia he again struggled to stay out of the limelight and it was a not altogether successful time. In the summer of 2013 he returned to England, signing a three-year deal with Sale and making clear his desire to once again vie for an England place. 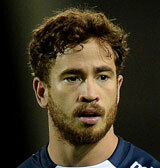 Danny Cipriani scored the decisive try for Sale against Leicester.